We are currently looking to partner with other builders to forge a relationship for future projects. 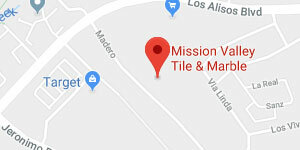 Mission Valley Tile and Marble is a full-service tile and stone contracting firm locating in South Orange County. We have been in business for over 25 years and have worked with many established builders such as The Irvine Company, The New Home Company, California Pacific Homes, Brookfield Homes, Manning Homes and William Lyons Homes to name a few. Mission Valley Tile and Marble specializes in the full spectrum of ceramic tile, glass and natural stone installations, including counter-tops, tub surrounds, showers, walls, fireplaces and floors. Our integrity, attention to meticulous detail and professionalism has created a rich history of success with many prominent developers on production tracts as well as custom homes and commercial projects. Please take a moment to review Mission Valley Tile and Marble’s list of references attached. Mission Valley Tile and Marble looks forward to the opportunity to bring our years of proven industry experience, expertise and quality workmanship to your Team. Most importantly, Mission Valley Tile and Marble brings to the table, team support with wisdom and integrity, creating pathways and success forged by excellent. We wish you and your team success and happiness in the coming years. We thank you for your consideration and look forward to hearing from you.